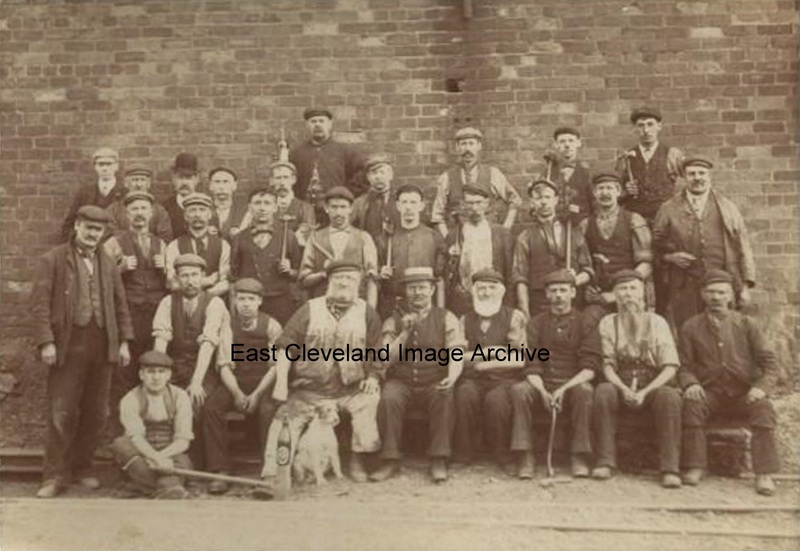 This image (from a postcard produced by J. E. Huntrodd of Brotton) is of surface workers from Huntcliffe mine, the clue is in their clothing and particularly their trousers. When supplied (by Geoff Kitching) he commented about atleast two people in the image can also be found in the image ‘Lumpsey 2’. The gentleman on the back row (now known to be Mr Ralph Clough, Mine Engineer) he was at Huntcliffe and moved to Lumpsey; also the miner in the front row (with a terrier dog) also features in the same Lumpsey image. There may be other matches but leave it to eagle-eyed viewers to assist. Any assistance with names would be welcomed. Image courtesy of Geoff Kitching, with researches courtesy of Tom Kitching .